"Here’s when re-creating real things with edibles is legit: when you’ve already made the really real things. Case in point: after our 2nd graders studied Havdalah for weeks, grew besamim and harvested it, made besamim containers, and dipped beeswax tapers to twist into Havdalah candles. Very real. But wait, there’s more: as the culmination of the unit, they helped lead the congregation in Havdalah. Again, undeniably real. 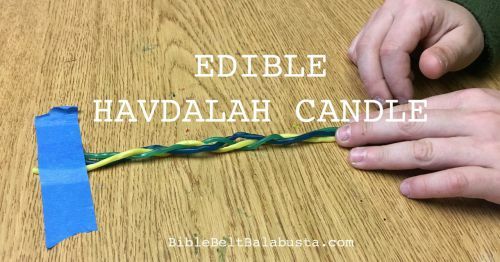 So, during the next day’s Sunday School, I let them take the last 10 minutes of art class to make a thematic treat: they braided kosher candy laces into edible Havdalah candles. Bonus: because only one kid had already mastered braiding, it became a sweet little skill-builder, too. This is the educational context for my edible havdalah candle. Taken out of context, I guarantee my Pinterest pin will be slammed as fluff, as a “crap-tivity,” as having no educational value, as being detrimental to children’s health, etc. Or worse, it will be seized upon as “cute” and then recreated as an end in itself, without context, without any of the really real, without an actual wax Havdalah candle in sight. I’ve seen this kind of thing happen so many times. Sob. Anyway, here’s what we did:"